Skat was founded in 1978, attached to the University of St. Gallen, as part of the Institute for Latin American Research and Development Cooperation. The acronym “SKAT” originally stood for Schweizerische Kontaktstelle für Angepasste Technik, meaning Swiss Centre for Appropriate Technology. The legal constitution was an association whose members were mostly Swiss development NGOs, some representatives from public and private institutions, and individuals. Our initial purpose was to establish a resource centre to document, and make accessible, the experiences of Swiss organizations involved in development cooperation. Particular focus was on the introduction and scaling up of appropriate technologies. The role of Skat staff evolved as simple requests from users of the resource centre developed into more complex consultancies on knowledge transfer. To cope with the rising demand, we focused on a few core areas of competence: water & environmental sanitation; architecture & construction; and transport. The spectrum of Skat’s activities and competencies grew steadily, with Energy and Climate and Governance becoming established as an expertise. In 2018 Skat celebrated its 40 anniversary. 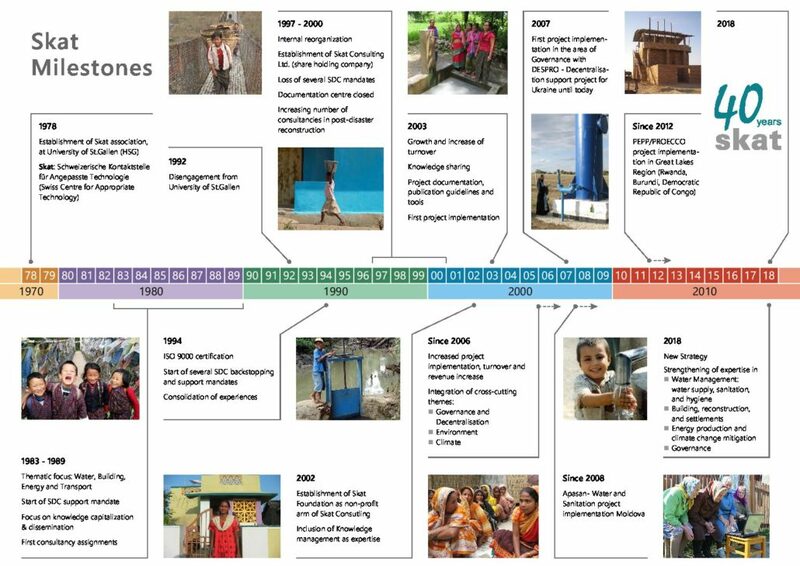 Have a look in our anniversary brochure and read about 40 years of Swiss development cooperation with stories from the field. It is this clear thematic focus – coupled with professional skill, learning from networks and sensitivity for a holistic approach to achieve sustainable solutions – that brought Skat to the fore with a worldwide reputation for excellence. By the 1990s, the funding landscape had shifted and Skat had to adapt to survive; and in 1997, the decision was taken to become a private consultancy. For us, knowledge is wealth to be shared, not hoarded. This ethos was hardwired into the organisation through the establishment of Skat Foundation. These dramatic shifts were successful and a big part of our success has been the balance between commercial professionalism and a strong ethic to serve the needs of the poorest and most marginalized communities around the world. Today, Skat Consulting Ltd, has an excellent worldwide reputation for high quality, cost-effective work that delivers impact for clients and improves lives and livelihoods for some of the world’s most vulnerable communities and households. In 2001 Skat’s Board of Directors decided to set up the Skat Foundation together with the NGO’s Helvetas, Caritas, and Swisscontact. The Skat Foundation is a non-profit institution for sharing and disseminating Skat’s longstanding knowledge and experience with partners in the developing world in a professional manner, and for initiating new activities to promote the exchange of knowledge and experience in development cooperation. Skat Consulting Ltd. bears all administrative and operating costs of the Skat Foundation. This unique arrangement means that Skat Consulting Ltd. has practical, state-of-the-art experience in development cooperation implementation, action research and knowledge management that meets clients’ needs. Meanwhile Skat Foundation, based on Skat’s expertise as a resource centre, unlocks that knowledge and experience so that a much wider audience can benefit from the work of Skat and our many partners.